Oil company Cairn Energy is considering a partial flotation of its Indian exploration and production business on the Bombay Stock Exchange. The proceeds, the UK company said, would be returned to shareholders. The news came as the Edinburgh-based company posted annual profits of $79.1m (£45.5m), recovering from a loss of $15.7m in the previous year. It has also raised estimates for the amount of oil in its key exploration zone in Rajasthan, north-west India. 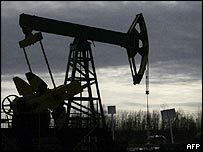 It estimated the zone held more than 3.5 billion barrels of oil, up from about 2.5 billion previously. "The support we have received in India, both politically and commercially, underscores the ability to do business effectively in this hugely important growth economy," said Sir Bill Gammel, chief executive. "We look forward to receiving formal approval from the government of India to proceed with the Rajasthan field developments." Is oil the new dot.com bubble?